Is inadequate follow-up after emergency department (ED) visits a common problem? In this article, the author outlines the results of studies that examined patients discharged from the ED who required aftercare. Whether or not these patients received the follow-up care and the effect this had on their risks for further complications are discussed. Ontario's emergency departments (EDs) handle about 5.4 million patient visits annually (Vermeulen et al. 2013). While much policy and media attention has focused on the wait times, overcrowding and quality of care experienced during these visits, relatively little attention has been paid to the issue of aftercare, that is, the follow-up care patients should receive from their primary care physician or a specialist after discharge from the emergency department. About 90% of patients are discharged from the ED after their evaluation, and a great many require aftercare (Vermeulen et al. 2013). To my knowledge, no hospital or jurisdiction routinely tracks follow-up after ED visits as a quality measure, although many routinely report performance with respect to wait time targets (Alberta Health Services 2014; National Health Service 2014; Ontario Ministry of Health and Long-Term Care 2014b). Emergency medicine leaders (including me) seem to have largely ignored the issue. For example, in a study I conducted with colleagues at the Institute for Clinical Evaluative Sciences (ICES), 48 high-priority, evidence-based ED quality of care indicators were identified; none were related to follow-up care (Schull et al. 2011). Is inadequate follow-up after ED visits a common problem? In another ICES study (Schull et al. 2013), investigators looked at patients discharged from Ontario EDs following an acute exacerbation of congestive heart failure (CHF), chronic obstructive lung disease (COPD) or diabetes, all conditions where follow-up visits are recommended. We found that 15–31% of patients saw no physician within 30 days of ED discharge (Figure 1). About 65% of patients saw only their primary care physician in follow-up; the proportion seeing both a primary care physician and a relevant specialist varied from 3% (COPD) to 14% (CHF). This may not be too surprising, considering that fewer than one in three primary care physicians in Canada report always being notified when their patients visit an ED (Schoen et al. 2012). If physicians are not advised of the ED visit, how are they to ensure appropriate follow-up? There is growing evidence that follow-up care matters to patient outcomes. An ICES study by Lee et al. 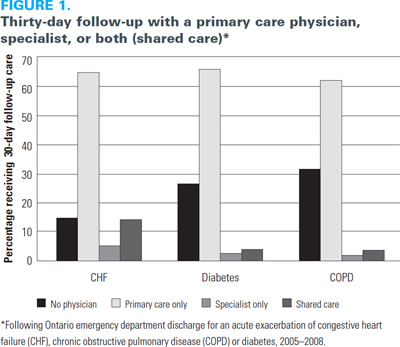 (2010) identified 10,599 patients sent home from Ontario EDs between 2004 and 2007 with a diagnosis of CHF and determined the type of physician follow-up each patient had in the subsequent 30 days (seen by a primary care physician, a cardiologist, both or neither). They then looked at the association between the type of follow-up and patient mortality one year later, after controlling for a variety of patient demographic, medical history and treatment confounders. In propensity-matched analysis, patients who were seen by both a primary care physician and a cardiologist (so-called collaborative care) had a hazard ratio (HR) for death at one year of 0.79 (95% confidence interval [CI] = 0.63–1.00), as well as a reduced risk for a heart failure–related ED visit, hospitalization or death (HR = 0.87; 95% CI = 0.75–1.01) compared with patients who saw no physician in follow-up. Patients who saw only a primary care physician showed a similar significant reduction in the risk of death, as well as a significant reduction in the risk of a heart failure–related ED visit, hospitalization or death compared with patients who saw no physician. Several other studies reached similar conclusions. Czarnecki et al. (2013) examined aftercare among 56,767 higher-risk patients with prior cardiovascular disease or diabetes who had been sent home from an Ontario ED with a diagnosis of "chest pain." Chest pain is among the most common reasons to visit an ED, and patients presenting with this complaint typically receive an assessment in the ED that includes laboratory tests and electrocardiography in an attempt to rule out a heart attack or other acute cardiac problem. However, it is not possible to dismiss serious cardiac pathology in a single ED assessment. Hence, patients deemed safe enough to discharge after an ED assessment are virtually always recommended for prompt follow-up and additional testing. However, Czarnecki found that 25% of these patients saw no physician in follow-up within 30 days. After adjusting for potential confounders, patients who saw a cardiologist following their ED visit had a significantly lower risk of death or myocardial infarction at one year compared with those seeing a primary care physician only (HR = 0.85; 95% CI = 0.78–0.92) or no physician (HR = 0.79; 95% CI = 0.71–0.88). Atzema et al. (2013a) found a similar association between aftercare from primary care physicians and risk of death at 90 days among 12,722 patients discharged from Ontario EDs with atrial fibrillation, a common cardiac rhythm disturbance that frequently leads patients to visit the ED. These studies also shed light on the mechanisms behind the increased risk associated with poor follow-up after ED discharge. Patients seen in follow-up were more likely to be taking evidence-based medications and undergoing needed investigations than were those who missed follow-up, suggesting that they had modifiable risk factors that could be positively affected by prompt physician follow-up (Czarnecki et al. 2013; Lee et al. 2010). None of these studies explain why substantial proportions of patients do not receive any follow-up after an ED visit for a serious illness, nor do they identify interventions that could reduce the lack of follow-up. There are likely several approaches to addressing this knowledge deficit, but a primary consideration should be raising awareness of the problem. The three key groups we need to target in this regard are the emergency physicians discharging the patients, the primary care physicians and specialists who need to see the patients in follow-up and, finally, the patients themselves. As a researcher and practising emergency physician, I believe inadequate attention is paid to the process of discharging ED patients. Efforts have been made to improve the communication of discharge instructions (Atzema et al. 2013b); yet discharge planning from the ED, often identified as a priority, especially among the elderly, remains spotty at best (McCusker et al. 2009). Interventions are less likely to work without first ensuring that clinical training and practice reinforce the importance of patient follow-up after ED discharge. Next, making it easier to refer patients, such as through the eReferral system being trialed in Alberta (Born et al. 2014), or, better yet, being able to book a follow-up appointment before leaving the ED could help patients avoid "falling through the cracks." Until such systems are routinely available, the best approach for the emergency physician may be to spend more time with patients at discharge to ensure they understand that their aftercare could be as important as the care they receive in the ED. Physicians receiving referrals also need to be accountable for their performance with respect to seeing higher-priority patients within a reasonable time frame, and understanding the crucial role they play in ensuring patients get appropriate treatment and investigations (Born et al. 2014). Hospitals need to be engaged too, by making it easier for ED visit documentation (the results of laboratory tests, diagnostic imaging and electrocardiogram tracings and a legible clinical note) to be routinely transmitted to primary care physicians and specialists, along with the follow-up or consultation request. In the absence of such information, prioritizing patients for follow-up by the primary care physician or specialist is, at best, a guessing game. Specific policy incentives could be designed to improve patient follow-up. For example, Ontario's Health Links initiative (Ontario Ministry of Health and Long-Term Care 2014a) creates new healthcare structures designed in part to improve the integration of healthcare at the local level for medically complex patients with chronic disease. Health Links brings together community-based primary care physicians and, often, an acute care hospital. Why not track rates of timely follow-up after ED discharge for patients with high-risk conditions at the Health Links level, using routinely collected administrative data, and create incentives for improvement that could be reinvested in Health Links? Given the absence of monitoring and reporting of follow-up rates or any incentives (or disincentives) for physicians making referrals or those responsible for follow-up, it is hard to identify any forces that would motivate providers to address the issue. Meanwhile, poor integration of care for patients as they transition from one silo to another (e.g., from the ED to the community) is often cited as the greatest shortcoming of our healthcare system. Fixing this problem is a daunting challenge, one that may require a step-by-step search for solutions. Timely ED aftercare for high-risk conditions is an interesting place to start and a good example of an evidence-informed outcome that requires better local health system integration for improvement. Michael J. Schull, MD, MSc, FRCPC, is president and chief executive officer of the Institute for Clinical Evaluative Sciences, and professor in the Department of Medicine at the University of Toronto, in Toronto, Ontario. Dr. Schull practices as an emergency medicine specialist at Sunnybrook Health Sciences Centre in Toronto. He may be contacted at michael.schull@ices.on.ca. Alberta Health Services. 2014. Emergency Department Wait Times. Edmonton, AB: Author. Retrieved March 24, 2014. <http://www.albertahealthservices.ca/4770.asp>. Atzema, C.L., P.C. Austin, A.S. Chong and P. Dorian. 2013a. "Factors Associated with 90-Day Death after Emergency Department Discharge for Atrial Fibrillation." Annals of Emergency Medicine 61(5): 539–48.e1. March 20 [Epub Ahead of Print]. Atzema, C.L., P.C. Austin, L. Wu, M. Brzozowski, M.J. Feldman, M. McDonnell et al. 2013b. "Speak Fast, Use Jargon, and Don't Repeat Yourself: A Randomized Trial Assessing the Effectiveness of Online Videos to Supplement Emergency Department Discharge Instructions." PLoS One 8(11): e77057. Born, K., A. Laupacis and S. Pendharkar. 2014. Improvements Suggested to the Health System That Failed Greg Price. Toronto, ON: Healthy Debate. Retrieved March 24, 2014. <http://healthydebate.ca/2014/03/topic/quality/hqca-greg-price>. Czarnecki, A., A. Chong, D.S. Lee, M.J. Schull, J.V. Tu, C. Lau et al. 2013. "Association between Physician Follow-Up and Outcomes of Care after Chest Pain Assessment in High-Risk Patients." Circulation 127(13): 1386–94. Lee, D.S., T.A. Stukel, P.C. Austin, D.A. Alter, M.J. Schull, J.J. You et al. 2010. "Improved Outcomes with Early Collaborative Care of Ambulatory Heart Failure Patients Discharged from the Emergency Department." Circulation 122(18): 1806–14. October 8 [Epub Ahead of Print]. McCusker, J., D. Roberge, A. Vadeboncoeur and J. Verdon. 2009. "Safety of Discharge of Seniors from the Emergency Department to the Community." Healthcare Quarterly 12(Special Issue): 24–32. National Health Service. 2014. A&E Waiting Times and Activity. Leeds, United Kingdom: Author. Retrieved March 24, 2014. <http://www.england.nhs.uk/statistics/statistical-work-areas/ae-waiting-times-and-activity/>. Ontario Ministry of Health and Long-Term Care. 2014a. Community Health Links Provide Coordinated, Efficient and Effective Care to Patients with Complex Needs. Toronto, ON: Author. Retrieved March 24, 2014. <http://www.health.gov.on.ca/en/pro/programs/transformation/community.aspx>. Ontario Ministry of Health and Long-Term Care. 2014b. Emergency Room Wait Times. Toronto, ON: Author. Retrieved March 24, 2014. <http://www.health.gov.on.ca/en/public/programs/waittimes/edrs/default.aspx>. Schoen, C. R. Osborn, D. Squires, M.M. Doty, P. Rasmussen, R. Pierson et al. 2012. "A Survey of Primary Care Doctors in Ten Countries Shows Progress in Use of Health Information Technology, Less in Other Areas." Health Affairs 31(12): 2805–16. November 15 [Epub Ahead of Print]. Schull, M.J., A. Guttmann, C.A. Leaver, M. Vermeulen, C.M. Hatcher, B.H. Rowe et al. 2011. "Prioritizing Performance Measurement for Emergency Department Care: Consensus on Evidence-Based Quality of Care Indicators." Canadian Journal of Emergency Medicine 13(5): 300–9, E28–43. Schull, M.J., M. Vermeulen, T. Stukel and E. Fisher. 2013. "Follow-Up and Shared Care following Discharge from the Emergency Department for Exacerbations of Chronic Disease." Canadian Journal of Emergency Medicine 15(Suppl. 1): LOP05. Vermeulen, M., A. Kachra, R.H. Glazier, C. Atzema and M.J. Schull. 2013. AHRQ Report: Patterns of Emergency Department Use in Ontario, 2004/05 to 2011/12. Toronto, ON: Institute for Clinical Evaluative Sciences. Extremely well written and pioneering article. Based on the cited sources, and our patient satisfaction surveys, we opened an ED follow up clinic and saw patients in this clinic as part of their transitional care. Unfortunately, we did not track quality metrics such as readmission to the ED, but we did complete a survey on patient satisfaction and the results were amazing. we hope to publish soon. thanks michael!